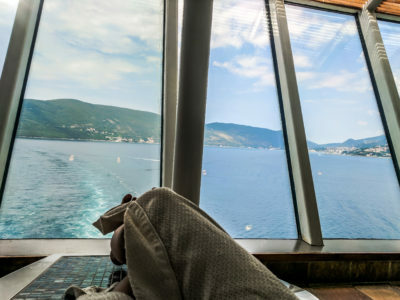 For the first time in our lives, we found out why they call sailing on a cruise ship a “pleasure cruise”, it really was one of the most indulgent experiences we’ve had in our lives! Two years ago, my parents came back from a week-long cruise out of Barcelona and were very pleased. Roman was very excited to go on a cruise as well, although honestly, I was less enthusiastic. 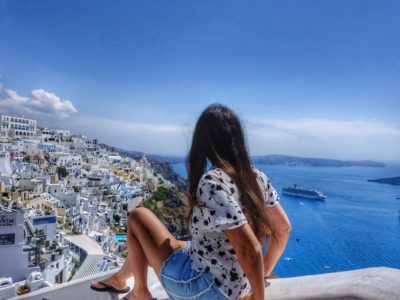 I was worried about sea sickness, being bored and in general that the experience wouldn’t fit our style, but given the blog I thought it might be a good idea to explore the world of cruises. 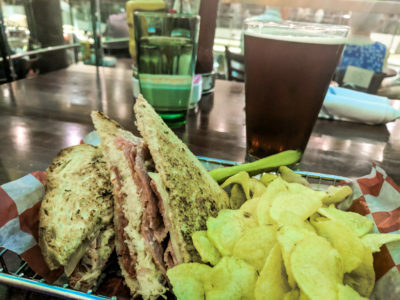 Many people like it, and I enjoy trying new things – so despite it being a luxurious vacation exceeding our travel budget, we decided to go for it and let’s just say, we fell in love with the cruise and want to go again! Where did we book the cruise? We decided to book the cruise though NCL, Norwegian cruise line, since that’s the company my parents cruised with. 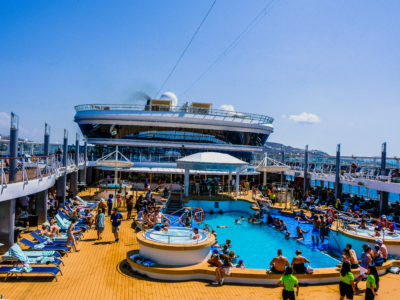 We ordered the cruise directly from their website, which offered many amazing looking cruises, but we chose the one which seemed most fitting a summer vacation. The cruise starts in Venice, continues to Kotor in Montenegro and then the luxurious Greek islands – Santorini, Mykonos and Corfu. The cruise is seven days. The stops at each destination are 6-8 hours, so there’s a little time to explore each destination and check what they have to offer. How much did the cruise cost? We booked the cruise seven months in advance (In November, booking it for June 2018), and chose the regular room (Room without a window which costs around 1060 dollars per person), a few months later we received a mail inviting us to take part in an auction for an upgraded room with a double bed and a balcony over the sea, definitely a substantial upgrade – we decided to try our luck and offered 660 dollars and after about a month received a confirmation that we had won. The cruise cost us 2780 dollars including the upgrade. It’s important to note that the price does not include port taxes of around 200 dollars for a couple, payment for services which is another 200 dollars for a couple, over the seven-day period. Meaning an additional 400 dollars to the price I mentioned. 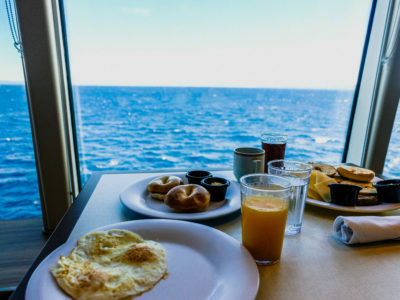 The price does include unlimited food and activities on the ship. The price does not include alcohol (There is free water and juices at the restaurants but not in the pool or rooms). You can also pre-order a spa package (Unlimited entrance to the spa) or chef meals at an additional price. Both of these improved our experience and are, in our opinion, highly recommended. Additionally, at the various stops you can go on tours offered by the cruise line. 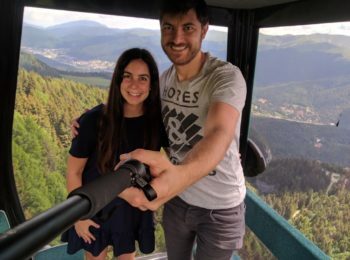 The tours are relatively expensive and we personally preferred to explore the destinations on our own (We also need plenty of time for photographing and so preferred not to be limited by the tour’s schedule). You also have the option of ordered an unlimited drinking package, but we don’t drink enough to make it worth while and felt it wasn’t worth the extra cost. We flew to Venice on Saturday, and the cruise started on Sunday. We arrived excitedly at the port and were even more excited seeing the ship from afar. It as immense, we’ve never seen anything like it before. We followed the NCL signs and left our luggage at the entrance, to be transported directly to our room. We arrived at a large hall where we had to fill out a health form, then went over to the check-in station. There, you receive a number (Which determines when it’s your turn to go on deck). We arrived at the hall around 10 and a half, and the boarding started around 11AM. At 11 and a half our number was called and we entered the ship. You may board the ship as late as 17:00, but we wanted to get in as soon as possible. As soon as we boarded the ship, we were stunned by its size and beauty. At the check-in station we were given a map to the ship, and there’s a reason for it. If the ship seemed big from the outside, from inside it felt even bigger. We went for a walk around the ship to get a sense for all it had to offer. 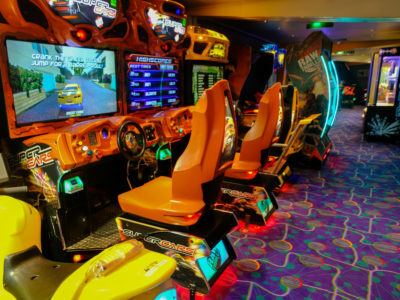 We discovered bars, restaurants, a casino, a pool, an adult only area with two jacuzzies, a gym, a kids playing area, a video game area, a spa, a duty-free, a basketball court and more. Afterwards, we went to eat at the buffet. At one point, it was announced over the speakers and the rooms were ready (Around 15:00), so we went to our room. 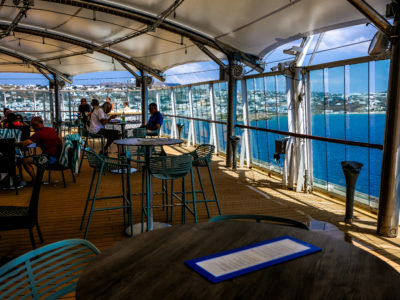 While you obviously spend most of your time outside the rooms, since there is plenty to do on the ship, as well as a sop at a new destination almost every day – the room was still one of the best parts of our vacation. It’s on a level with a high-class hotel room, but even better, as it has a balcony with a small table and two chairs, constantly offering a new view. You wake up, open the curtains and discover a new destination. 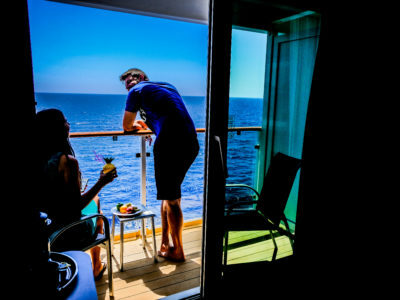 If you don’t have the means of affording the upgraded room, you’ll still enjoy the cruise, but if you can upgrade – I think you should. We fell in love with the room and didn’t want to leave it. The room also has a bathroom with a shower cabin and a toilet, a closet, dresser and television. 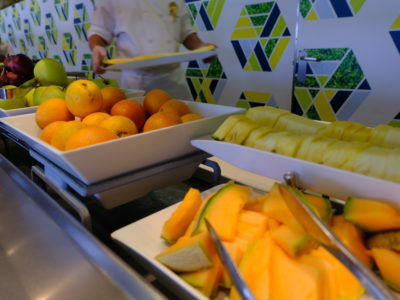 The buffet has an enormous variety of food, salad stations, cooked food, sandwiches, pizzas, meats, fish, vegan and vegetarian options, a pasta station where they make it per your request, lots of fruits and desserts, a crepe station and ice-creams. The buffet is open from morning to night, with changing food throughout the day. 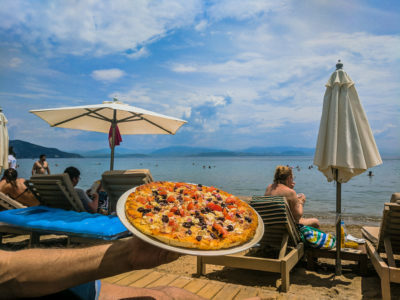 There is also a daily special every evening, such as a barbeque dinner, Italian dinner and more. In addition to the buffet, there is an Irish restaurant open all the time which offers great Irish food. One of my favourite dishes there was a causer salad with salmon. It was great, as was the apple pie. There is also a great Asian restaurant, however it was usually at maximum occupancy and you had to wait in line for a table (You’re given a buzzer to let you know a table is ready for you). There were also a few slightly fancier restaurants offering a first course, mains and desserts which were good. The pool area has fast food such as hot dogs, hamburgers and French fries. I really liked the option of building your own meal, with special toppings like fried onion, pineapple and more. 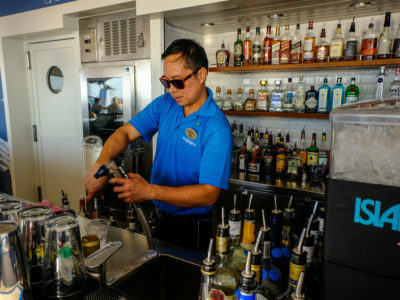 There are also bars offering good cocktails (For around 12 dollars), as well as a daily cocktail for a lowered cost (Around 9 dollars). 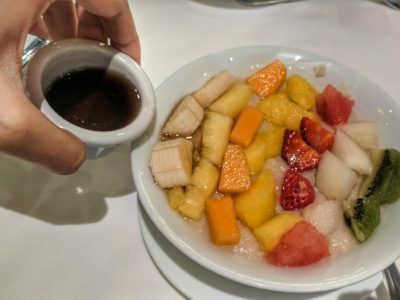 For breakfast, you can visit the buffet, the Irish restaurant or the fancier restaurant, and they all have great breakfast menus. We liked the fancy restaurant the best when it comes to breakfast. They have special dishes like Benedict pear with salmon and a cream cheese and salmon bagel. You can also ordered fruit, pancakes, oatmeal and more. You may also get room service whenever you want! You can purchase a package of 3-7 chef specially prepared meals. 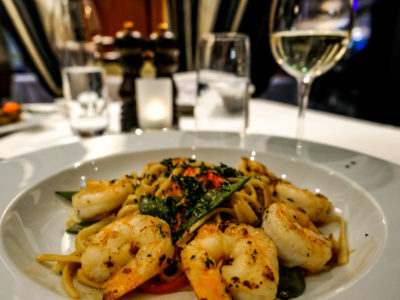 The price of a 3 restaurant package is a total of 89 dollars per person, and it’s easily worth the price. 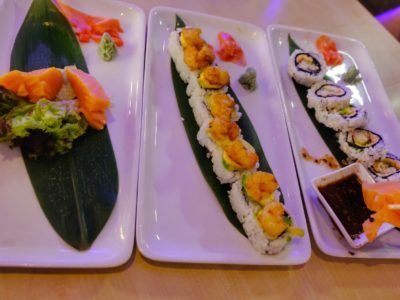 We had the 3-meal package and the food was exceptional. We went to a French restaurant, a Japanese one and the steakhouse. 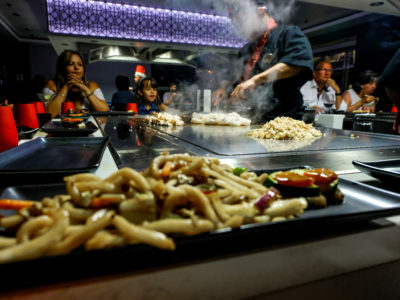 The Japanese restaurant was a lot of fun, it’s like a cooking show on a steel counter. 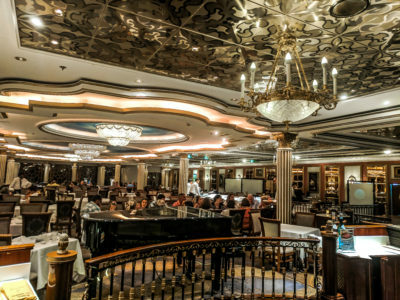 The French restaurant and steakhouse were on a level with luxurious chef restaurants with 5-star service and perfect food. 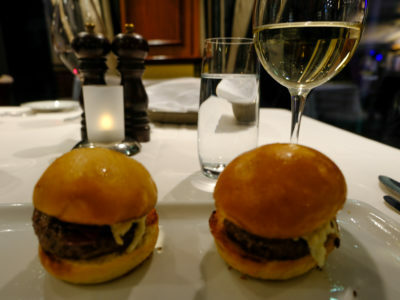 We ordered wine with our meals, as well, and enjoyed ourselves a lot (If you’re foodies like us, you’ve got to upgrade yourself to the chef package. You won’t be sorry. I recommend pre-ordering the package online, as well as booking seats at the restaurants you want as fast as possible, since when we tried booking a table on the first night – some of the restaurants were already hard to find a free table at). Initially, I thought paying an extra cost for a spa (Not including any treatments, only the facilities themselves) was going to be a waste. But we found it was one of our favorite places on the ship and visited nearly twice a day. It’s a very relaxed place with barely any people. 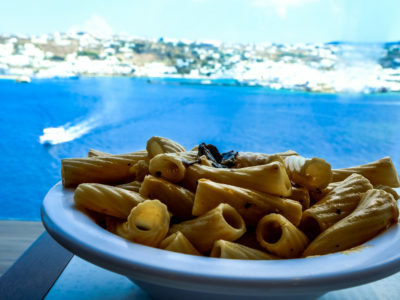 There are huge windows overlooking the sea and the amazing view. 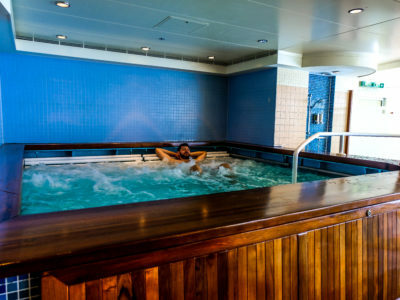 There are two types of Jacuzzi and a mineral pool, a relaxation area with couches and a tea station. The crown jewel for us were the heated stone beds in front of the windows. I read a book there every day, and sometimes even fell asleep on them and it was the most relaxing activity possible. The pool area is really fun. There are a lot of comfortable beds, four jacuzzies, a pool and a food and bar area. We really liked sitting in the jacuzzi or on the beds and drinking a cocktail. Sometimes there were pool games or a DJ who played good music. It got crowded at times, so I think it would have bee nice if there was another pool. Each day you’re given the schedule for tomorrow. 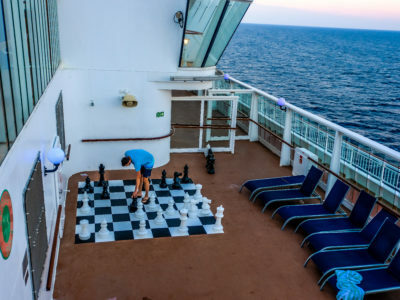 Those who choose not to get off the ship at stops has a ton of activities such as games, movies and more. 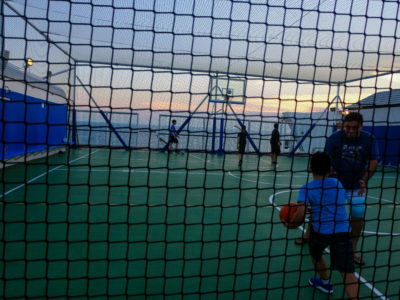 There are also activities throughout the day such as tournaments (Basketball and ping pong tournaments) and sportive activities (Some at an extra cost), at night there are shows, Karaoke and dance parties. 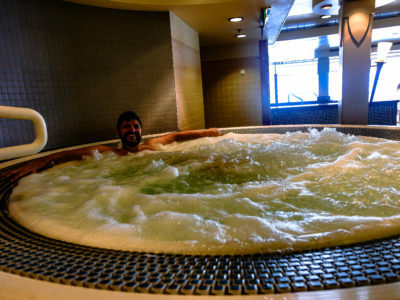 I have to admit, we had such a good time at the spa, the pool, restaurants and our room that we hardly took part in any of the offered activities, but we have heard a lot of praise about them. The gym was modern and well equipped, overall a pleasure to train at. 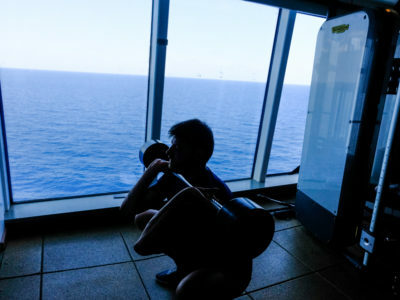 We went three times (We had to burn off some of the calories from all the food on the ship). We also liked walking around the deck in the evenings. 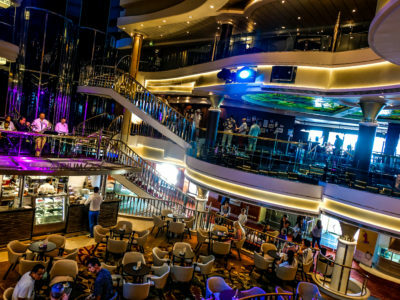 Another nice things the cruise offers are mixers of all kinds, for example an LGBT mixer, as well as mixers for singles and 18-25 year olds. We were bummed to find no mixers for 30-year-old couples. 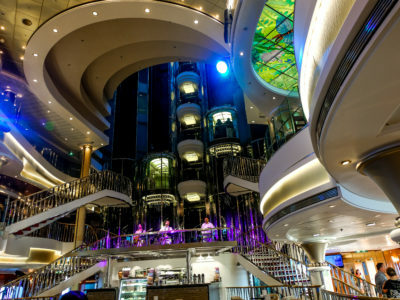 The ship’s lobby often sports musicians and singers, who also appear in other areas of the ship, such as in front of the French restaurant. We enjoyed spending the afternoon listening to the saxophone player. At most of the destinations we hadn’t anchored at the port itself but rather near it and took little shuttles across. If you hadn’t ordered a tour through the cruise line, you’ll have to get a ticket in the morning which determines the shuttle boarding order. I recommend going as early as possible to collect your ticket, since there can be quite a substantial line. The stops at each destination are between 6-8 hours, so we got the chance to enjoy each one. 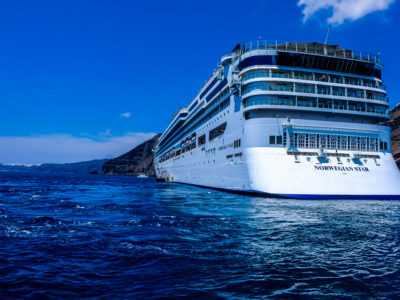 If you choose not to take the cruise’s tour, I recommend researching each destination ahead of time, in order to efficiently see as much as possible and not waste time during the stop itself. 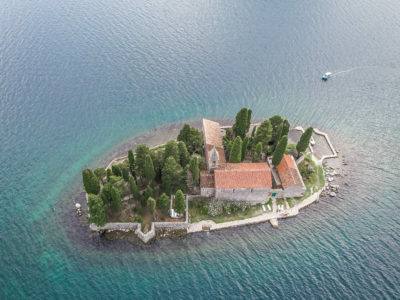 As for the destinations themselves, each place was gorgeous – we want to go back to all of them now for a vacation. 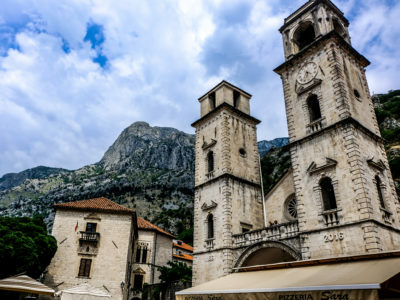 Kotor was really special, with an ancient fortified city. We also visited the town of Perast, using busses as our main transport. 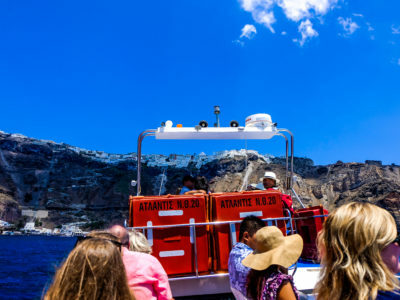 In Santorini we rented a scooter, which was great, as it allowed us to get a lot done – We visited the red beach, a restaurant with an amazing view, and drank wine at an excellent wineyard. On Mykonos we toured little Venezia and went to the beach (On foot). On Corfu we visited the old town and took a bus to the beach. We were supposed to stop at Dubrovnik, Croatia, as well but the stop was aborted due to high winds. It was a little disappointing, since we were really looking forwards to it, but on the other hand we had more time to spend on the ship which was great as well. Who is the cruise best suited for? 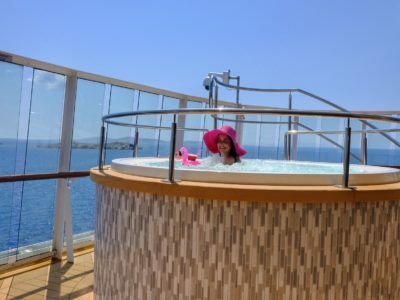 The cruise is well suited for just about anyone. The ship we were on had a very diverse crowd, families, adults, couples and youngsters. 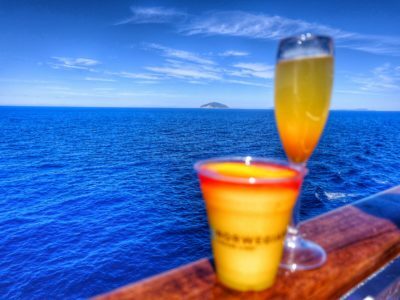 The cruise is for anyone looking for a luxurious vacation. Anyone can find his own personal style on the ship. We are less into crowds and activities, so we preferred time at the pool, spa, restaurants and stops at the unique destinations. Families have a lot to do, as there are activities around the clock. In short, the cruise can fit those looking for peace and quiet, as well as those looking for constant action and activity. It is also handicap accessible. We ran into several people in wheelchairs, as well as a guy with crutches. * Don’t forget that the cruise’s price does not include port taxes and services. 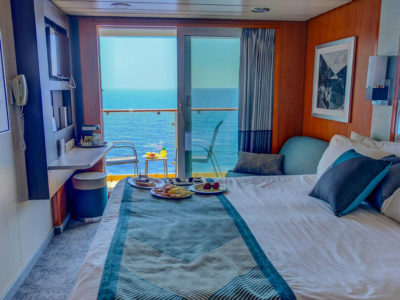 * If you have a limited budget, you can still enjoy the cruise a lot without upgrading your room or getting the restaurant and spa packages. There is enough to do without the extra cost. * NCL has a huge variety of cruises all over the world and you can find cheaper/more expensive ones, as well as shorter/longer cruises. 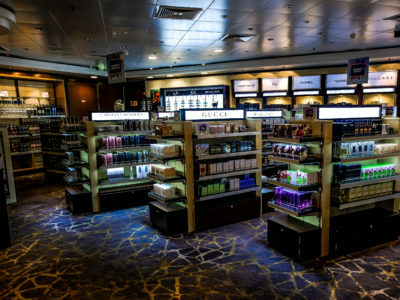 * If you’re flight lands on the day of the cruise, you have the option of ordering a ride from NCL’s website to pick you up at the airport and take you straight to the port. 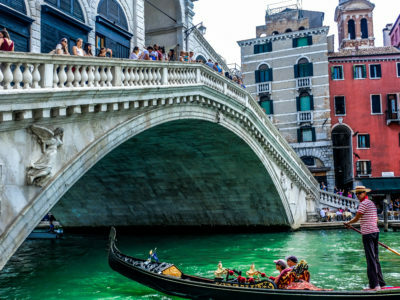 * Our flight back home was in the afternoon after returning to Venice, the company offers luggage storing at 5 euros per bag or an even better service of transporting your luggage straight to the airport in accordance to your arrival there. 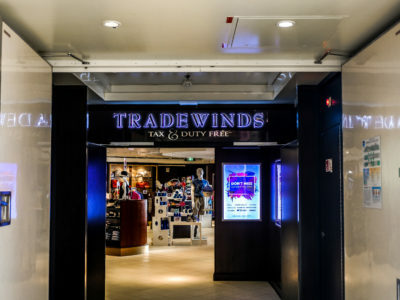 That service costs 12.5 euros per bag and was great for us, since it allowed us to travel light in Venice and take the bus straight to the airport without having to go back to the port and get our things. * To save costs, it’s recommend to pre-order the upgraded packages, such as the spa package, through the company’s website. * Water bottles are quite expensive on the ship, but you can buy 6/12/24 water large water bottles at half price on the ship. 6 water bottles cost as 14.5 dollars instead of 29 (They are sent directly to your room). 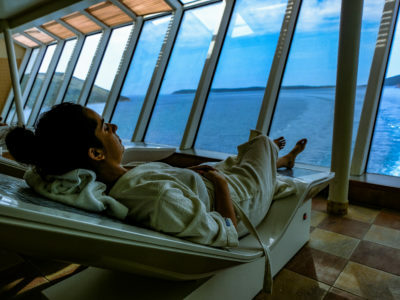 * If you tend to suffer from sea sickness and nausea, it’s recommended to got on the cruise during the summer months when the water is calm. The ship is massive and we hadn’t felt the sailing at all. * Coffee is one of the cruise’s weak points, so I recommend looking for good coffee on your stops. 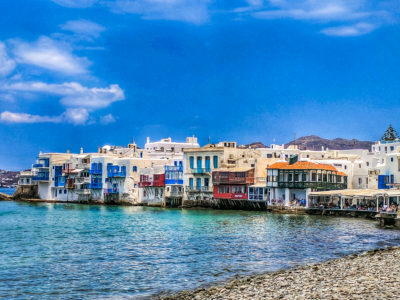 On Mykonos, for example, we found a great café with excellent coffee. * We really liked the destinations, as they were well suited for a summer vacation. If you’re not into beaches and tanning, I’d recommend picking a cruise which offers destinations with more options and activities. * Some of the cocktails, such as the mango cocktail, can be ordered alcohol-free for half the price. * There are on straws on the ship, so if you like to drink through a straw – bring one with you from home 🙂 (Roman told me to write this). 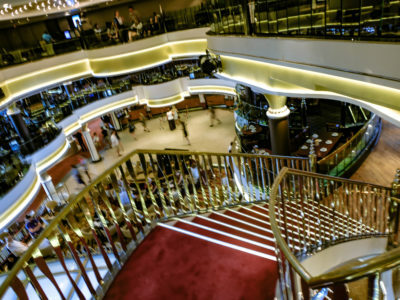 * Those ordering rooms from a suite-level and above are entitled to preferential treatment during the stops, when boarding and disembarking the ship.